During the third weekend of September, the 5th Athens Flying Week 2016 took place, this time hosted at the Tanagra Air Base. Back in September of 2005, the gates of Tanagra base opened for the first time to the public for the first and only airshow in Greece. That show called “Archaggelos” (Archangel) had been organized by the Hellenic Air Force (HAF). More than 10 years later, the same gates opened again to host another airshow, this time a privately organized event: Athens Flying Week (AFW) 2016. Despite the AFW having been held at Tatoi airport for the past four years in a row, the airshow had to be moved to continue. The reasons for this are the new airshow safety rules and restrictions derived from the tragic Shoreham Airshow crash of 22 August 2015, when a privately owned Hawker Hunter crashed onto a busy highway after performing a miscalculated loop, killing 11 people and injuring 16 others. The new airshow rules do not allow fast jets to overfly populated areas. The only solution for the organizers of the AFW was to find an alternative airport further away from the city. The only feasible solution was Tanagra Air Base. The main problem was that this decision was made in the middle of the winter when preparations for the show were already underway, so everything had to be changed and reorganized. One advantage of the decision, the larger size of the airfield of Tanagra, gave the AFW team the possibility of having a static display (something that was always absent in Tatoi). The organizers of the show also had their concerns because Tanagra AB also presented a big disadvantage; the airport is 70 km away from Athens, which could result in reduced attendance by visitors from the general public. Despite countless setbacks during these initial steps by the show organizers, the AFW team decided to carry on and not cancel the show. Fortunately, the HAF backed up the decision and provided the field for the show. The two Squadrons of Tanagra were not active for the show’s duration, with many of their aircraft relocated to other bases. Despite the AFW’s initial concerns about reduced attendance, around 40.000 spectators visited the show during the weekend. The participants of AFW 2016 were pretty much the same as last year. The reason was that there were some notable cancellations, such as the Polish F-16C Tiger demo and Su-22 ‘Fitter’ demo team plus the Serbian privately owned Soko Galeb vintage jet, but mainly because the location changed in the middle of the preparations for the airshow. Nevertheless, the Hellenic Armed Forces and especially HAF supported the show by participating with a large number of aircraft. Both HAF solo display teams, “Zeus” with the F-16C and “Daedalus” with the T-6A, were present performing exceptional displays on both days of the show. Two F-4E Phantoms from 117 Combat Wing flew to Tanagra on both show days departing from Andravida to perform a simulated bombing raid over the airfield. 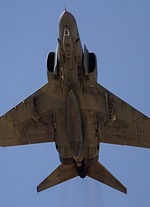 The HAF 114 Combat Wing, which was now host to the show, became a great contributor and participant in this year’s AFW. Two Mirage 2000s from 331 Sqn (on Saturday) and from 332 Sqn (on Sunday) took part in the flying display simulating dogfights in the skies of Tanagra. Besides the flying display, the static display was also enriched with aircraft from the base. This included some old, retired aircraft kept at Tanagra, like the A-7 Corsair II “Olympos” and “Tiger” specially painted aircraft. The Polish Air Force, a regular participant to the previous editions, sent the Bialo Czerwone Iskry (White and Red Sparks) aerobatic team. Named after its aircraft, the PZL TS-11 Iskra (Spark), the team flying seven of the training jets, which are now the oldest jets still in Polish service, appeared in AFW for the first time. The Polish participation didn't stop there, definitely the biggest highlight in the static display was the Polish Su-22 ‘Fitter’. Earlier the Polish officials had informed the team of AFW that they would be sending the Su-22 Demo Team, but due to other commitments, the demo was cancelled, sending this sole Su-22 instead. The Belgian Air Force provided the second F-16 solo display act. The Belgian Air Force is another great supporter of the AFW and its F-16 demo once again thrilled the crowds with its precise and perfectly executed flying display. Three military and one civil helicopter took part in this year’s flying display. The “Pegasus” demo team of the Hellenic Army Aviation with the incredible AH-64 Apache and the Hellenic Navy’s S-70 Aegean Hawk were presented. The civil EC-120B of “Aeroservices”, a Greek transport company, performed some aerial maneuvers. The third military helicopter and new addition to the AFW program was the Hellenic Air Force’s AS332C1 Super Puma, which demonstrated a CSAR (Combat Search And Rescue) mission. 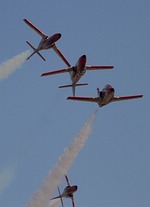 The famous Spanish aerobatic team Patrulla Águila was this year’s AFW headlining demo team. 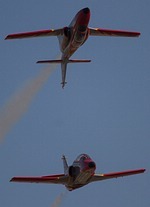 The team flying seven Casa C-101 Aviojets first performed in Greece 10 years ago at the very first airshow “Archaggelos” and returned to Tanagra this year. Amongst many special maneuvers, on both days the team performed its trademark act, a spectacular formation landing involving all seven aircraft. The Italian Grandpa's of the team "Blue Circe", all of them former F-104 pilots, joined the AFW again performing nice formations and maneuvers with their FL-100 piston-engine aircraft. The Italian “Silver Chicken” with a CAP-21DS and the Dutch Su-26MX “Dutch Rush” performed solo aerobatic acts. A nice addition was the Swiss “46Aviation” team flying a Boeing Stearman with wingwalker Danielle Hughes. There were also some vintage aircraft at the show from the “Athenian Aviator Collection”, which also took part in last year’s event. The Fi 156 Storch of 1935 and a Boeing Stearman of 1934 participated. A quite unusual participant was an airshow performer from Switzerland, the first man to fly a jet-propelled wing, known as the “Jetman”. Once again, both of last year’s glider displays performed their spectacular shows during the day but also during the evening. There were also some R/C aircraft that performed while each glider was being towed to altitude. Most probably one of the biggest highlights of the show appeared on Sunday, when a civilian airliner, a B737-700 of the Romanian low cost airline “Blue Air”, performed a low pass over the field while escorted by two Mirage 2000s. The 737, after performing some more low passes, landed at Tanagra and stayed for an hour before departing again. During the period on the ground, the young visitors of the show had the opportunity to visit the cabin of the aircraft and the cabin crews handed out some souvenir gifts to the kids. What makes the Athens Flying Week special is the fact that it combines all the aspects of modern aviation. This year visitors could also get close to and admire frontline military jets and helicopters, in addition to the trainers, vintage aircraft, light aircraft, airliners, gliders and even radio controlled models. We must admit that the new location raises the standard a lot. The organizers of the show are now facing the challenge of making the AFW airshow bigger, with more fighter aircraft, larger airplanes, more demo teams, along with provided an interesting static line-up. We hope that the Hellenic Armed Forces will continue and grow their tremendous support in making this possible.